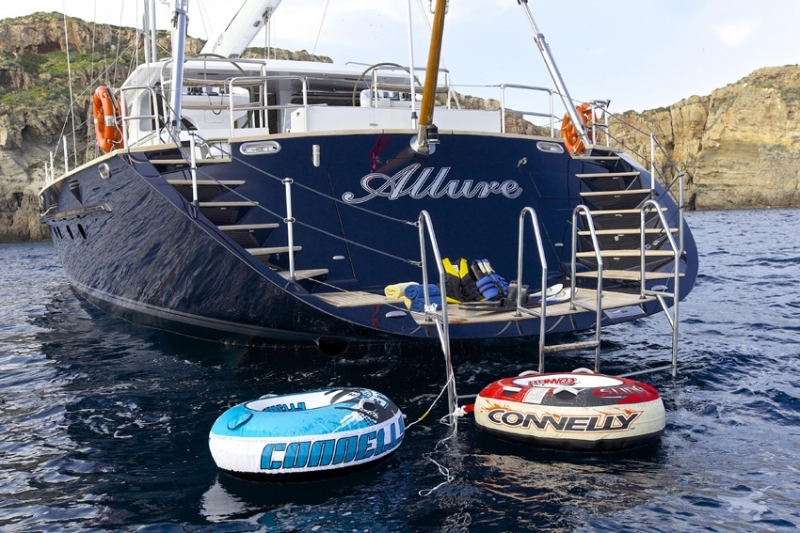 Tenders + toys: One tender Silinger 4,30m with Yamaha outboard 50hp, one Jet Ski Seadoo 250hp, one double water ski, one single water ski, one wakeboard, three SUP boards, one kayak, tubes, snorkeling and fishing equipment. 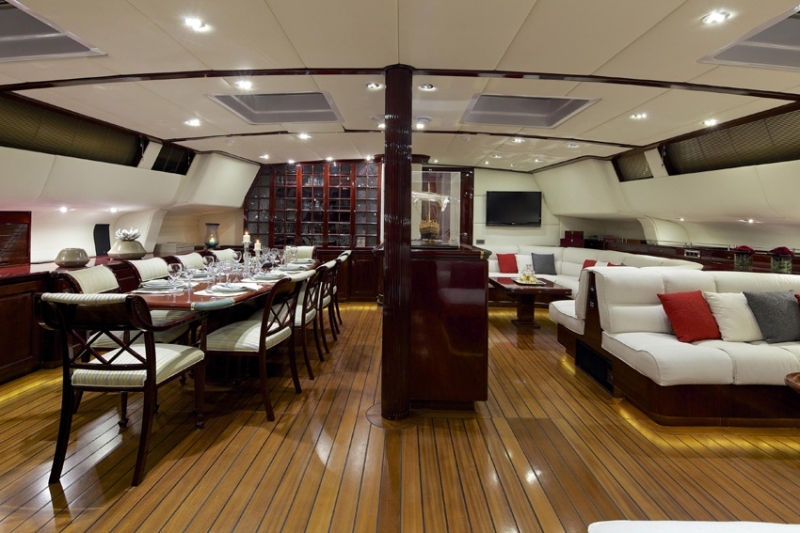 Luxury sailing yacht ALLURE was designed by naval architect Angelo Lauranos and built by Sterling Yachts of South Africa, she measures 40.53m (133ft) and was delivered in 1995. 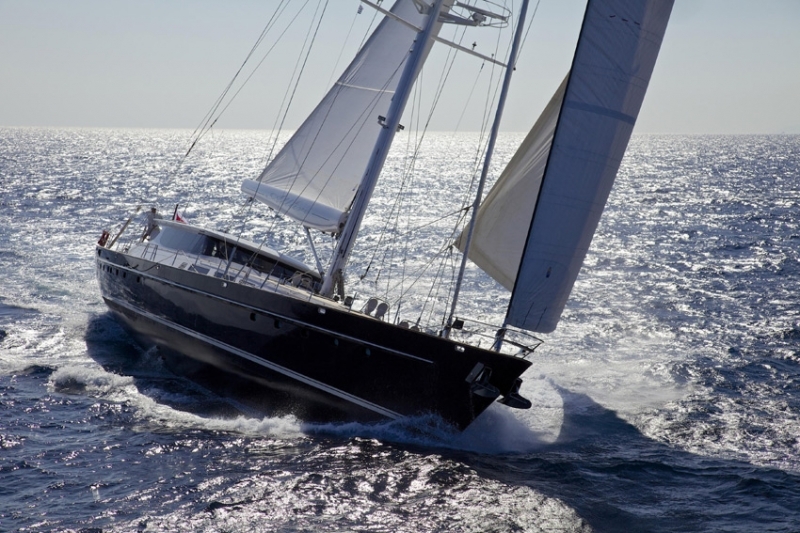 S/Y ALLURE (Ex. 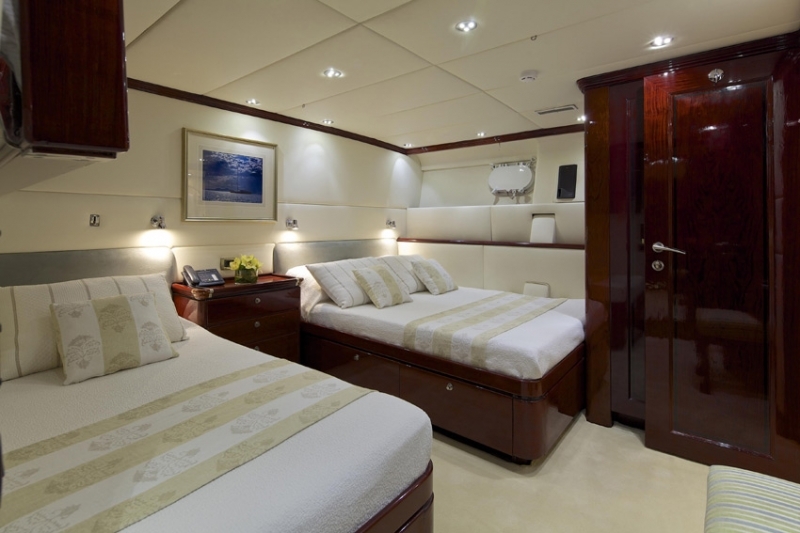 CORSTA V) was refitted in 2009 and can accommodate up to 10 charter guests in 4 en-suite cabins. 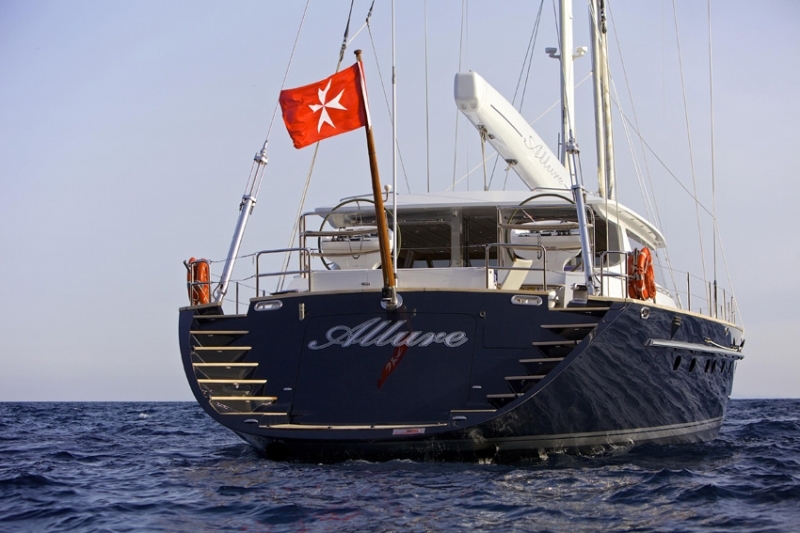 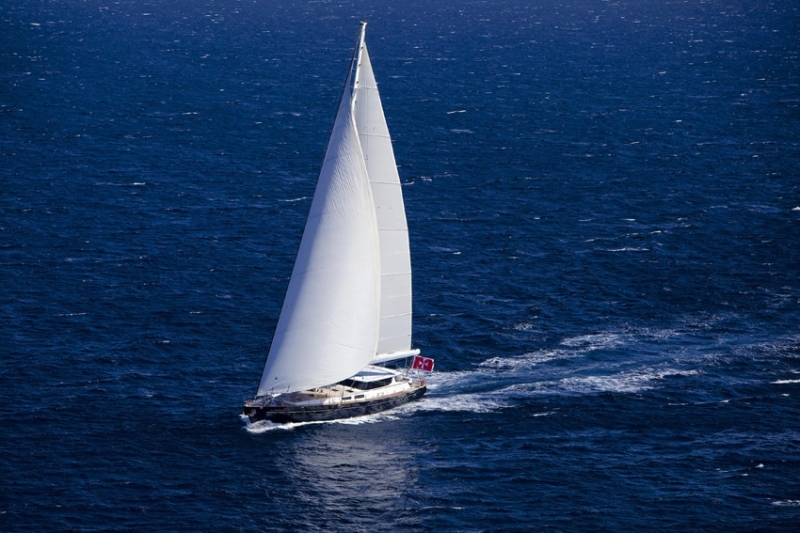 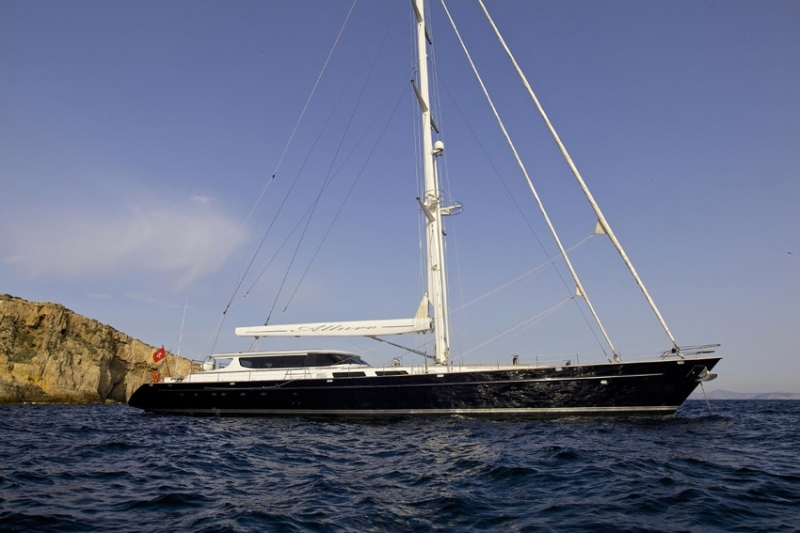 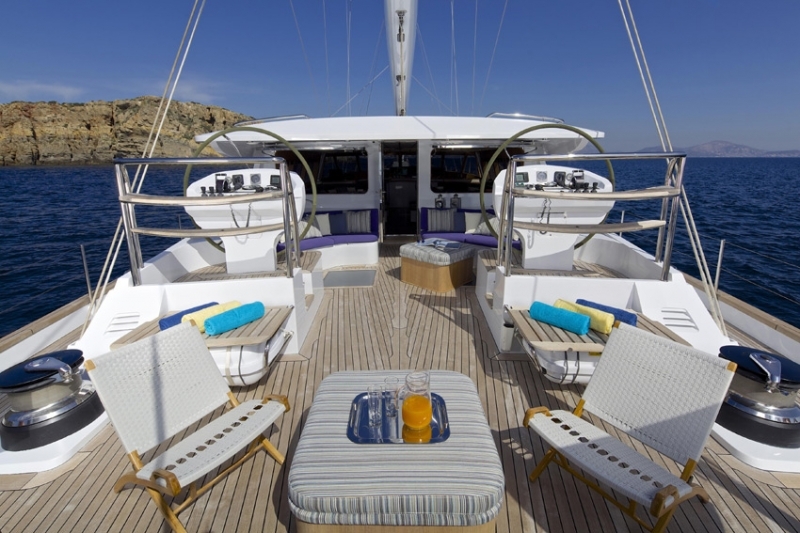 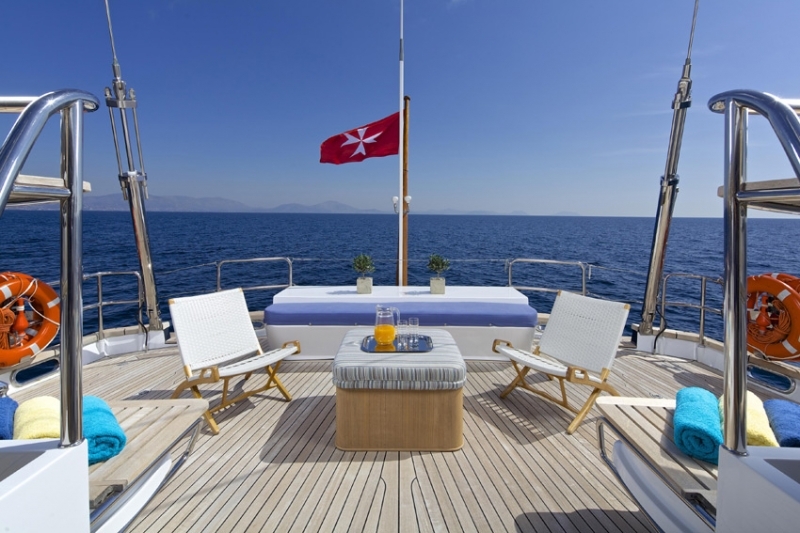 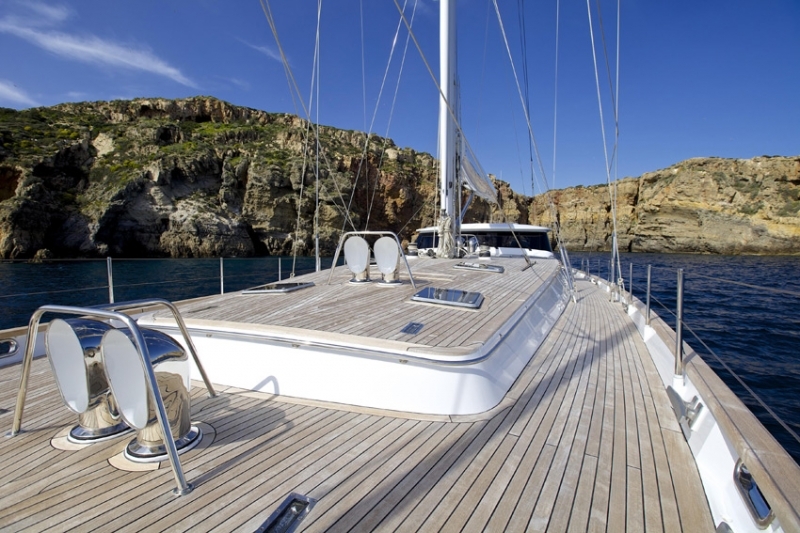 ALLURE offers a dedicated crew of 6 and is available in the East Mediterranean. 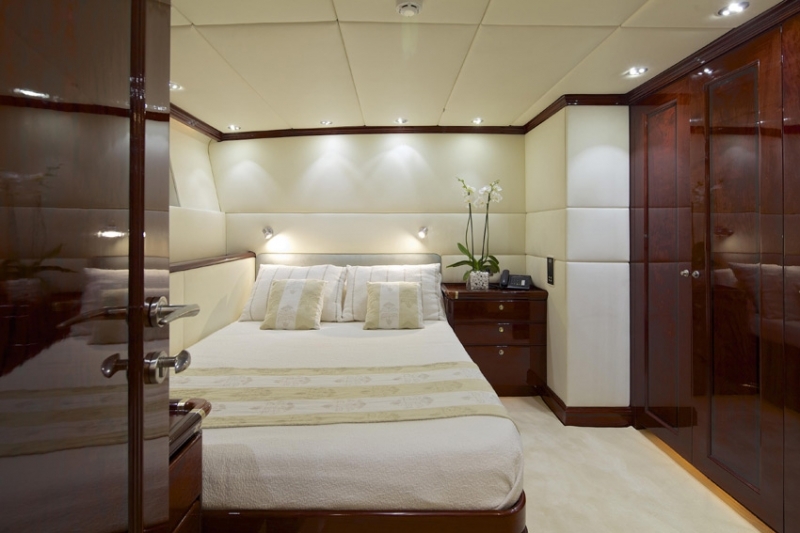 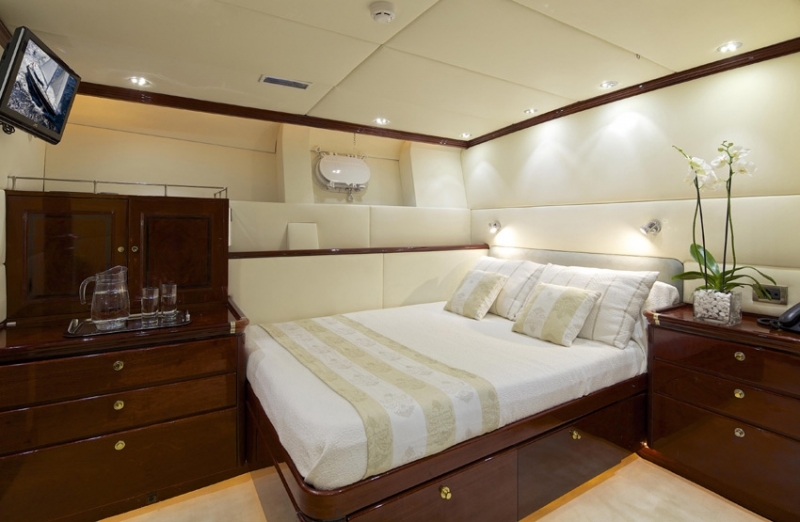 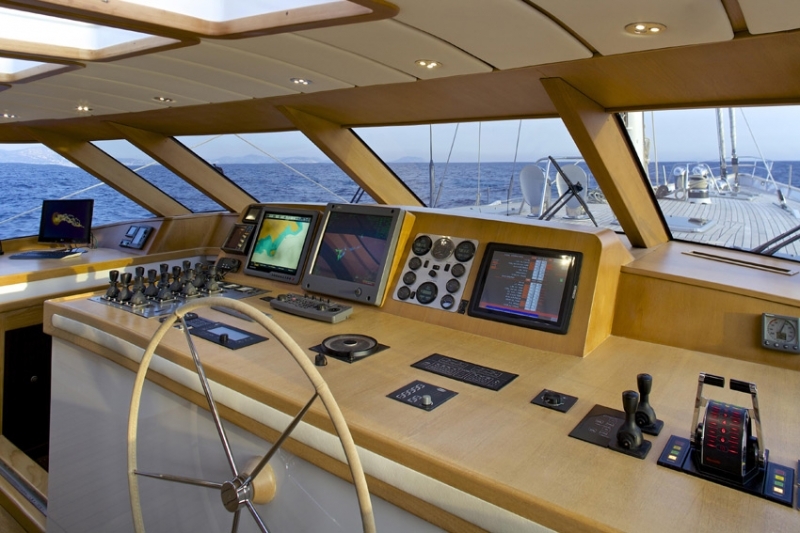 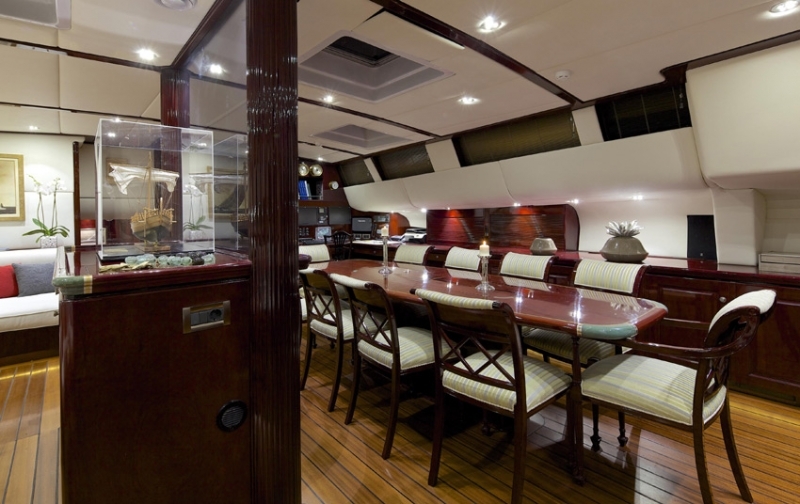 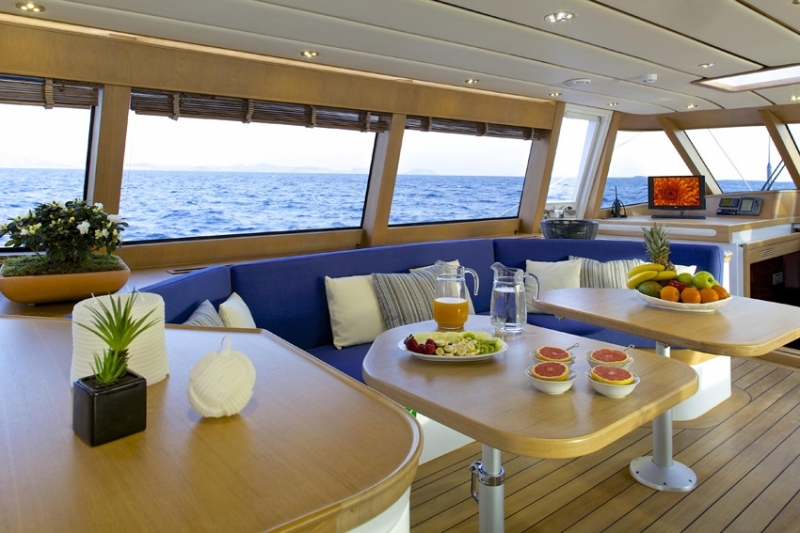 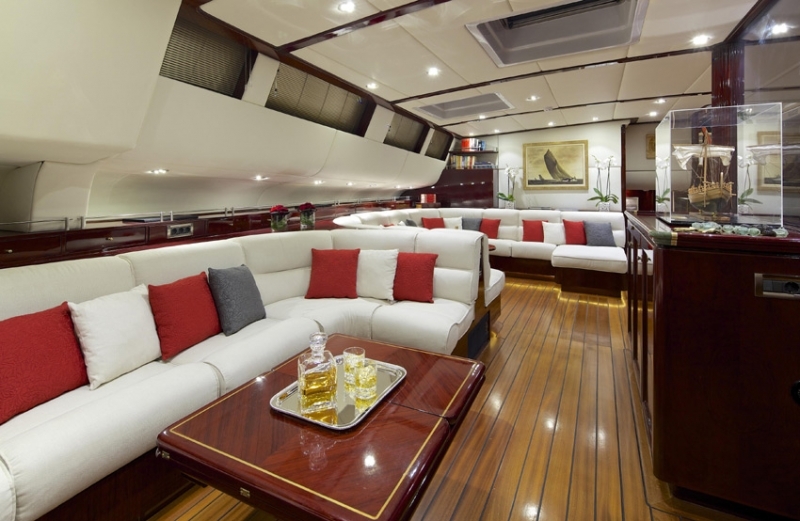 Below decks, crewed charter yacht ALLURE features design by Puleo Inc. / International Yacht Design. 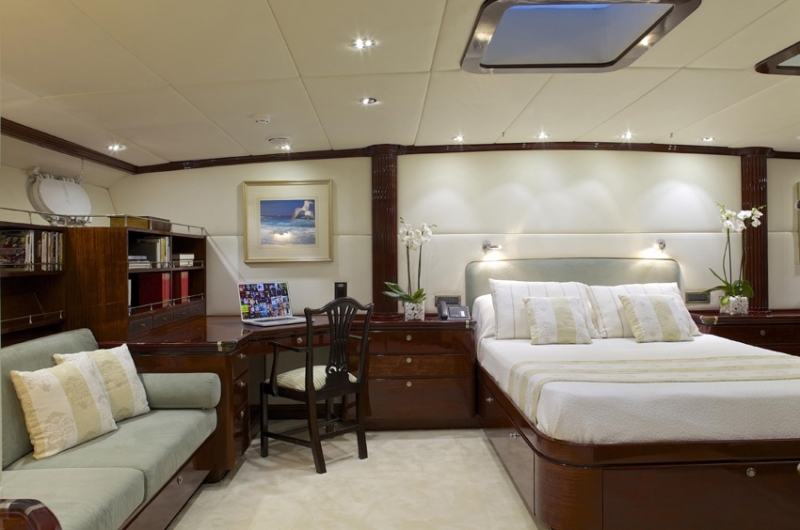 The décor is elegant, light and airy. 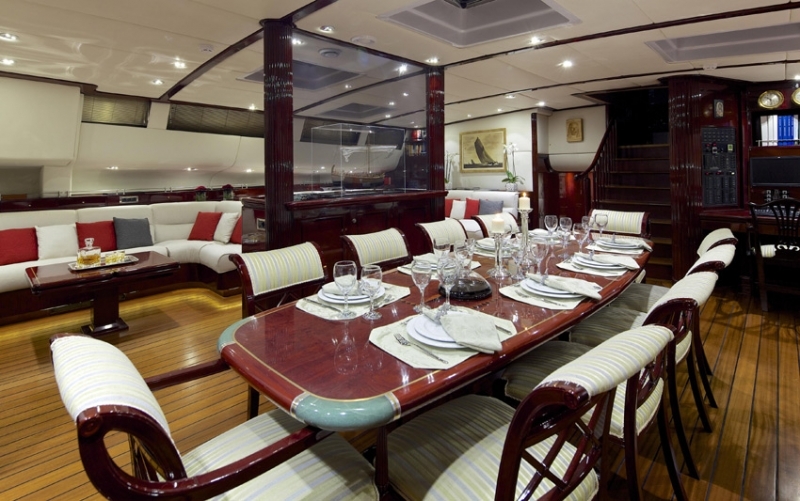 The salon and dining is a contemporary open plan, with the spacious lounge on starboard and formal dining to port. 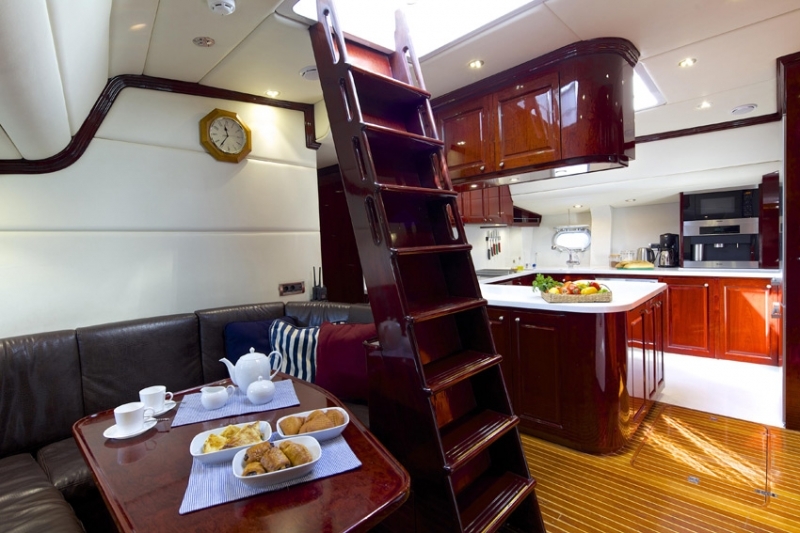 Luscious deep red wood finishes are complimented by crisp white soft furnishings, light cream headliner and honey toned plank wood floors. 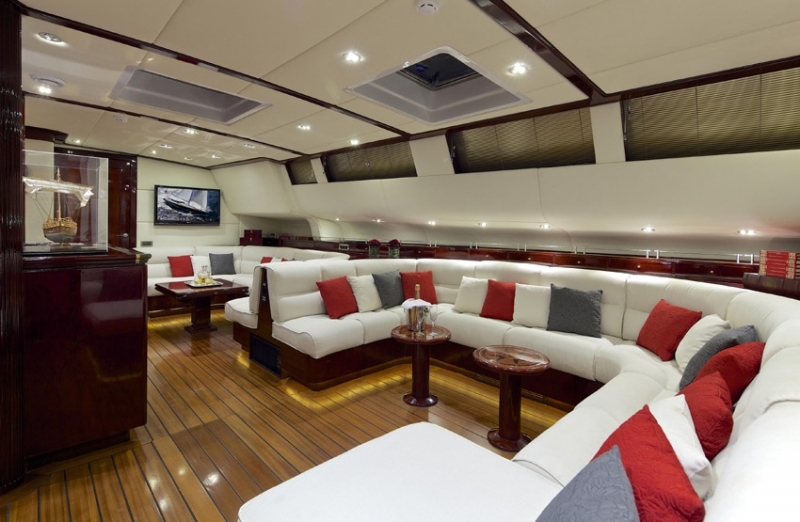 The entire space is welcoming and perfect for entertaining. 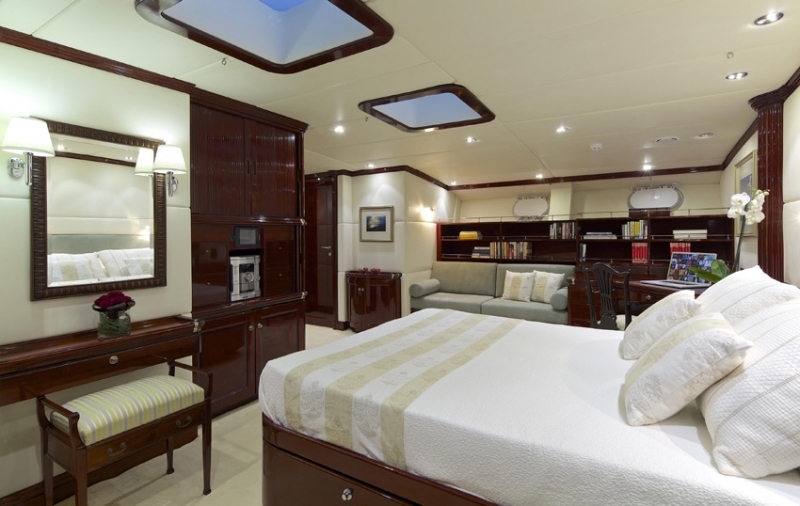 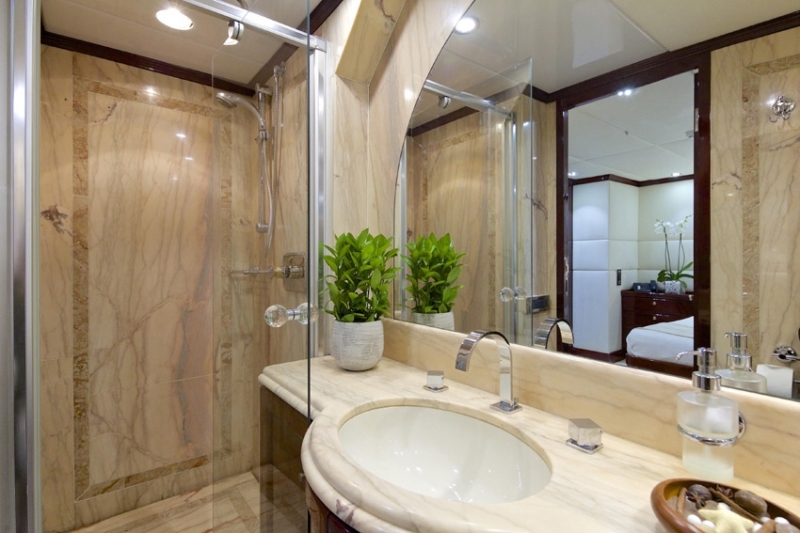 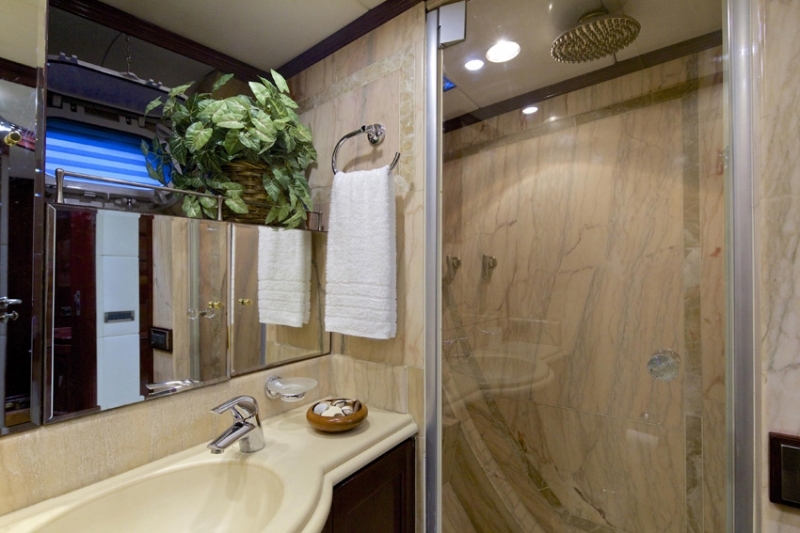 Guest accommodation is below decks in 4 generous cabins. 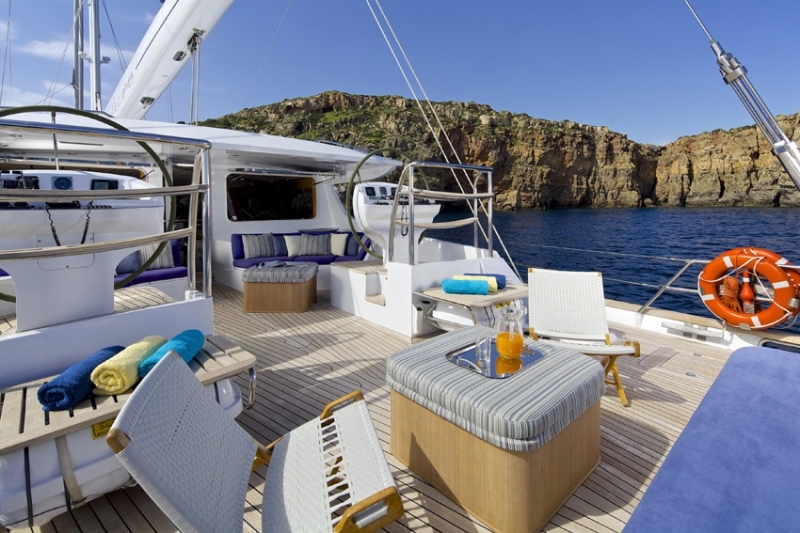 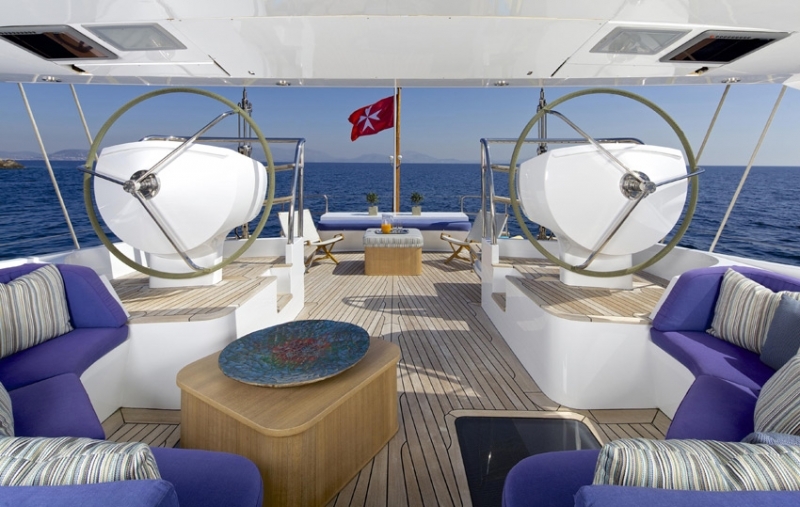 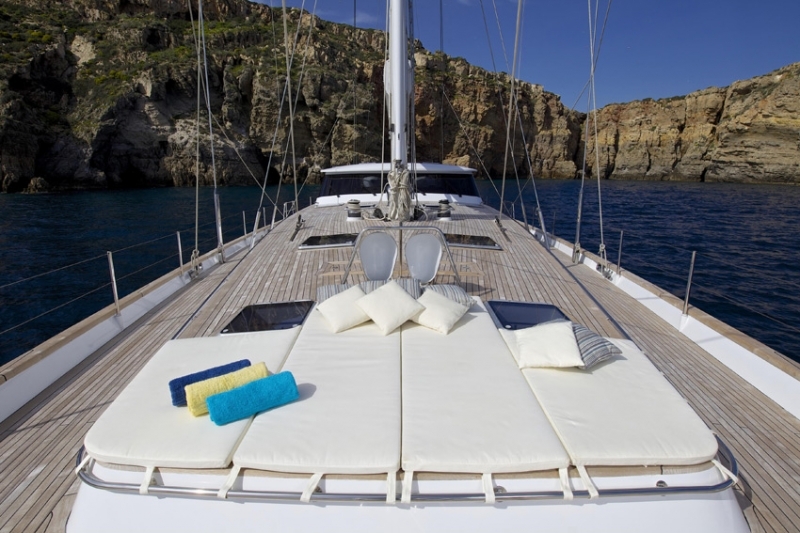 Aboard the sloop rigged sailing yacht ALLURE, there is ample exterior space to enjoy. 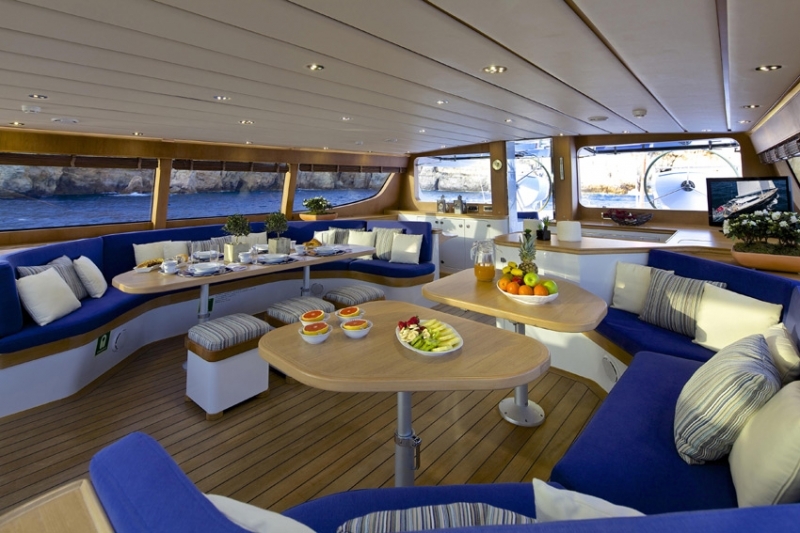 A partially enclosed bridge deck offers comfortable seating and alfresco dining, while boasting idyllic views from surrounding windows. 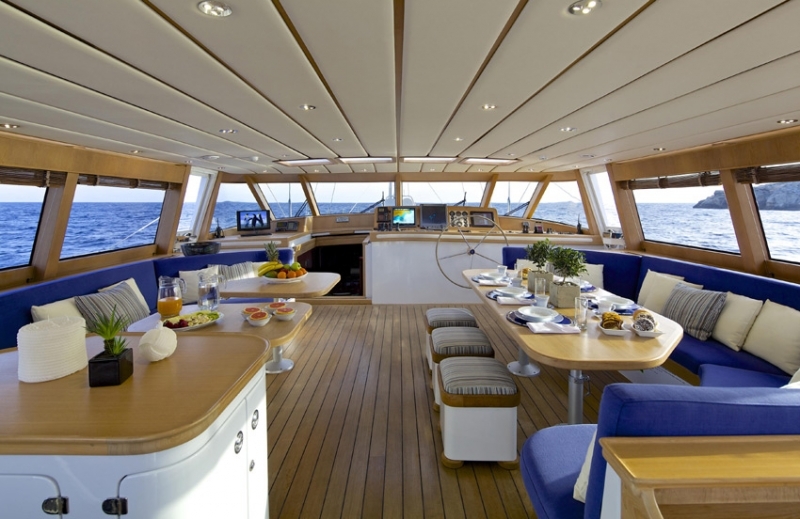 Further aft, the spacious teak decks features great seating and sunning options, followed by dual port and starboard transom steps, leading to a well-appointed swim platform and easy access swim ladders. 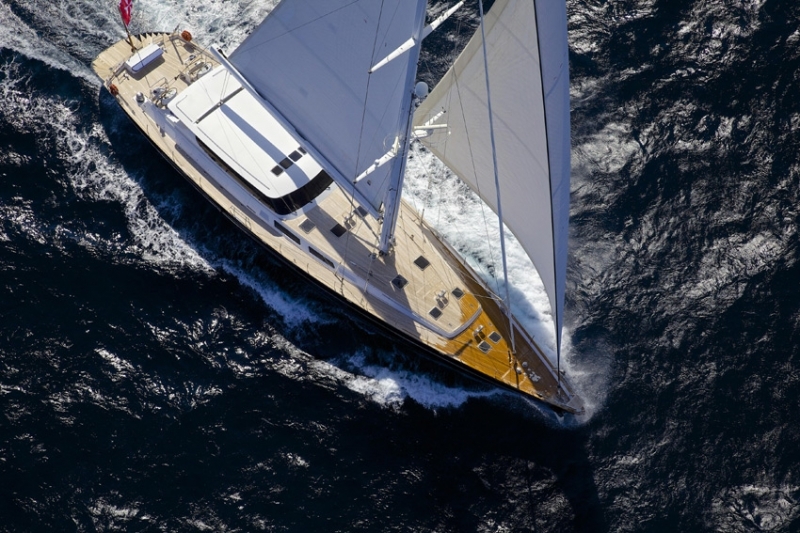 With a beam of 9m (29.6ft), S/Y ALLURE provides guests with wide wrap around decks, giving effortless access to her massive foredeck, complete with additional sunning on large sunpads. 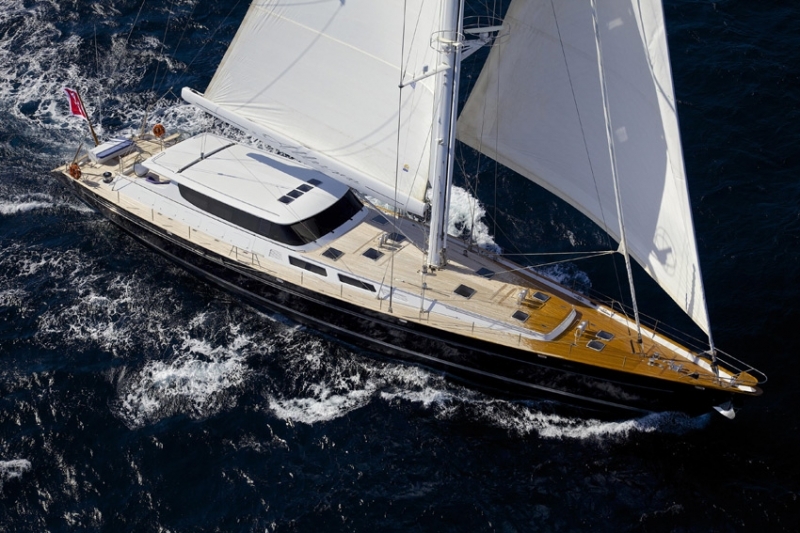 Powered by 2 Yanmar 465hp engines, the Sterling Yacht ALLURE is capable of 10.5 – 13 knots. 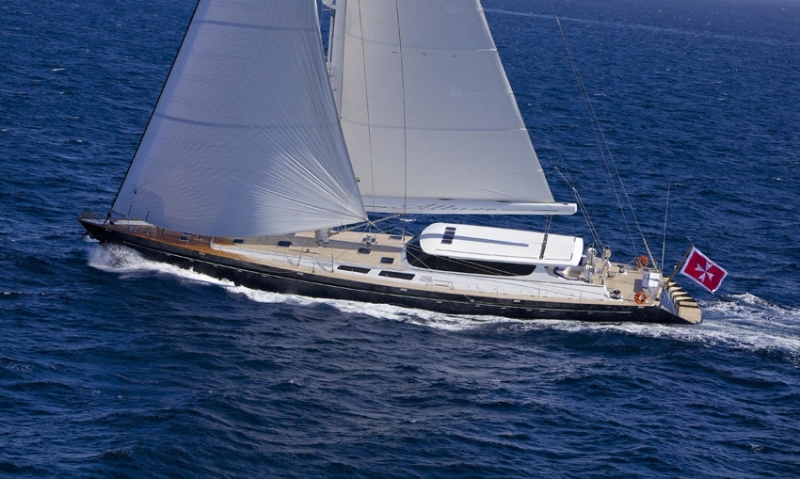 Her incredible 5942m2 of sail area is a stunning sight, gliding her sleek dark blue hull gracefully through the pristine East Mediterranean waters.